Front-line degreasing (Transconjunctival Blepharoplasty) and lipo transfer technology enables the removal of the excess under-eye fat-pad without any swelling and downtime. Additionally, by injecting the fat collected from the thigh or the abdominal area, dents formed by facial expressions are smoothened and more natural S-shaped curves are created. To produce even better results, Theory Clinic gives a “Puregraft Fat Injection” that uses “pure fat” created by reducing the impurities such as old fat, blood and water from the collected fat to less than 20%. By reducing the impurities from fat, the graft survival rate is improved by up to 80%. Fat that is collected from the patients’ body parts contains various impurities including water, blood, and dead and old cells, which reduce the graft survival and also cause lumps. To optimize the quality of fat that is to be injected, we use Puregraft 50 (fat tissue concentrator) to eliminate unnecessary tissues and water, only leaving stem cells and healthy fat. By using Puregraft, we can achieve a higher graft survival rate and more effective fat injection. Fat injection using patient’s own fat gives a natural finish; however, there are some disadvantages. CRF satisfies points 1 and 2 mentioned above. However, CRF is very costly and many patients are reluctant to receive it. Theory Clinic provides higher quality and safer fat injection by Puregraft that satisfies all the points. To improve graft survival rate, fat collected by degreasing needs to be purified by eliminating unnecessary components such as water, blood and dead cells. This process is usually done by using a centrifugal separator. However, common centrifugal separators can only remove water and grease. They cannot sort out cells. Since fat cells are very delicate, they may be easily damaged by the pressure of a machine. 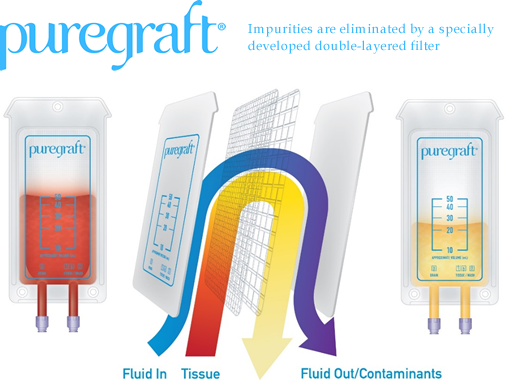 With a special double-layered filter, Puregraft 50 sorts out various cells contained in the liquid collected by liposuction and removes unnecessary components up to 80%. With Puregraft 50, a higher survival rate is achieved.It’s short processing time causes little impact on the fat cells. Proven!Puregraft leave surely the stem cells. 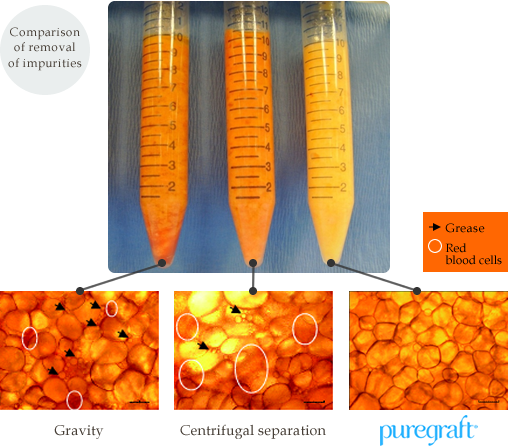 One of the remarkable features of Puragraft 50 is that it can maintain stem cells when sorting out cells and liquid. It removes only unnecessary components and leaves important stem cells. It has been proved that the processed fat cell liquid always contains stem cells derived from fat cells at a constant concentration. *Puregraft 50 (PureG 50) is approved by FDA (Food and Drug Administration, USA) and CE (European Quality Standard). Suture removal from the site where fat has was collected is not necessary. You can wear make-up from the next day; however, wait for 3 days to wear eye makeup. Wait for a week before wearing contact lenses. Do not rub the treated area. Some mucus may be secreted from your eyes for about a week. In that case, use eye-drops as prescribed by our clinic. You can take a shower on the same day and take a bath from the next day. Since warming you body increases swelling, do not take bath for a long duration of time for at least a week after the treatment. Why Puregraft can improve the graft survival rate? The most important factor for the survival of fat cells is to get the nutrients from the blood. When injected into the body, stem cells transform into blood vessels that supply blood and nutrients to the fat cells. Tiny new blood vessels are formed by injecting the collected fat. When these vessels combine with the injected fat, nutrients are circulated into the fat, which helps the fat to survive for a long time. It means that by replenishing stem cells, the number of fat cells is increased and new blood vessels are formed, thereby, increasing the survival of the number of fat cells.